Nutritional guidelines designed to make England's secondary school meals healthier are restrictive and cannot work, caterers will tell a conference. The Local Authority Caterers Association says it wants to offer one option which conforms to the new rules while still offering pupils a choice. 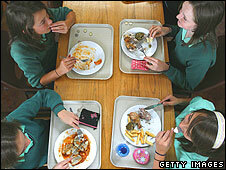 It said 80% of its members believed the new guidelines would lead to a decrease in take-up of school meals in England. But the School Food Trust says a balanced menu is achievable. The nutritional guidelines will be introduced in England's schools from September, one year after they took effect in primaries. They involve 14 nutrient-based standards. For example, the average secondary school lunch must contain no less than 7.5g protein and 5.2mg iron. The caterers' association, LACA, is warning that the guidelines restrict choice because designing school menus would be too time consuming. It wants to offer one main meal conforming to the nutritional standards, but continue to offer individual items popular with students such as pizza or baguettes. It warns that the "wide choice and a la carte menus" will change dramatically because the guidelines on vitamins and minerals are so restrictive. Neil Porter, LACA chairman, says the result of this will be that children will reject school food and buy lunch on the high street. "If the government is serious about the importance of school food in altering young people's eating habits and its contribution to reducing levels of obesity then it should act now," he said. LACA is responsible for catering in 86% of local authorities. Take-up of school dinners is now starting to rise in primary schools. But still under half of all pupils eat them - 43.6%. In secondary schools, take-up has fallen by over 5% since 2006. Last year a study by the Nutrition Policy Unit at London Metropolitan University also warned that too many children were shunning healthier canteens in favour of local shops. It suggested the inconvenience of queuing in uncomfortable and overcrowded canteens was a factor in driving pupils out of the school gates. Celebrity chef Jamie Oliver used a television series to highlight the poor nutritional content of some school lunches, leading to a series of new guidelines. Food standards were introduced by the Westminster government from September 2006 and standards for vending machines, breakfast clubs and tuck shops came into force a year later. The School Food Trust was also set up in 2005, to try to raise the quality of school meals. It says the nutritional standards were established after working with a number of different schools, all of which were able to produce an appealing and varied menu. "The nutrient-based standards are challenging but there is a very valid reason for them. "It is important they are in place to ensure we promote the health, well being and achievements of students," a spokesperson said. Children's Minister Delyth Morgan said: "There is no denying that the new nutrient based standards are challenging, but something had to be done about the quality of food being offered to many of our children." Caterers had had plenty of notice that these changes were coming in so they should have been prepared. "Schools that have been piloting the new standards have seen no fall in take-up." She said the School Food Trust pilots had worked with pupils and parents so that they had a say in the type of meals on offer - and were provided with choices. "This means schools can provide food that is popular and parents and pupils understand why the changes are needed." The government had been working with local authorities and schools to create better dining facilities and organise lunch breaks better because it knew students were put off if there was nowhere to sit, long queues, unattractive dining rooms or no time to eat.